Every time we went to the Domain, I would see the sign for Gloria’s restaurant and say “We have to try that place sometime.” Well sometime finally came, and now the only thing we’re wondering is why we didn’t make time to try it sooner! We were seated on their large patio, our choice for what was a perfect night of soft breezes, Then we opened our menus…the dinner menu for Lance, and the special vegetarian menu for me (yes, they have a complete vegetarian menu! I was delighted!) As we browsed, we snaked on warm tortilla chips and a salsa with a definite (and much welcome) kick to it. In a city filled to the brim with Tex-Mex, the delicate Salvadoran touch at Gloria’s was very welcome. Owners Gloria and Jose Fuentes come by their cuisine naturally. The two emigrated from El Salvador in 1978. After some difficult years in Houston, they moved to Dallas and soon were working with Gloria’s sister in her Salvadoran restaurant. A year later, they took over the restaurant, which they renamed Gloria’s. And the rest, as they say, is history. 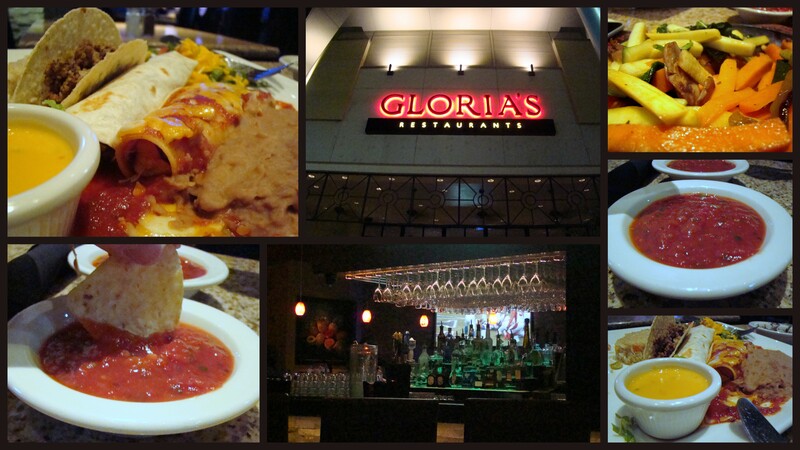 Gloria’s has gone from one small location to 14 locations around Texas. The business remains very much a family concern — according to our waiter, Gloria herself tries to visit each location once a week! Service was impeccable, even when I made a special request for something to be changed in my fajita. This restaurant is a definite must-go-again, especially when the breeze is mild and we’re planning a date night. This entry was posted in D is for Date Night, L is for Lunch, S is for Supper, V is for Vegetarian too :-) and tagged date, mexican, north austin. Bookmark the permalink.